VENGEANCE LPX memory is designed for high-performance overclocking. The heatspreader is made of pure aluminum for faster heat dissipation, and the eight-layer PCB helps manage heat and provides superior overclocking headroom. VENGEANCE LPX memory is designed for high-performance overclocking. The heatspreader is made of pure aluminum for faster heat dissipation, and the custom performance PCB helps manage heat and provides superior overclocking headroom. Each IC is individually screened for peak performance potential. Part of our exhaustive testing process includes performance and compatibility testing on nearly every motherboard on the market – and a few that aren’t. One setting is all it takes to automatically adjust to the fastest safe speed for your VENGEANCE LPX kit. You’ll get amazing, reliable performance without lockups or other strange behavior. Overclocking overhead is limited by operating temperature. The unique design of the VENGEANCE LPX heat spreader optimally pulls heat away from the ICs and into your system’s cooling path, so you can push it harder. Each VENGEANCE LPX module is built from an custom performance PCB and highly-screened memory ICs. The efficient heat spreader provides effective cooling to improve overclocking potential. The small form factor makes it ideal for smaller cases or any system where internal space is at a premium. The best high-performance systems look as good as they run. VENGEANCE LPX is available in several colors to match your motherboard, your other components, your case -- or just your favorite color. The DDR4 form factor is optimized for the latest DDR4 systems and offers higher frequencies, greater bandwidth, and lower power consumption than DDR3 modules. 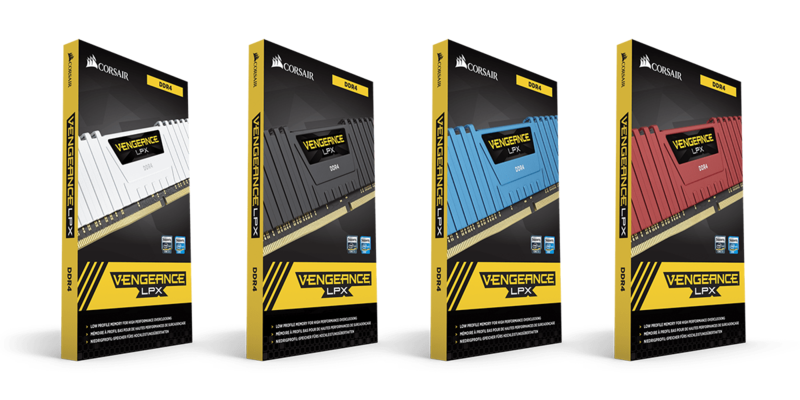 VENGEANCE LPX DDR4 modules are compatibility-tested across DDR4 systems for reliably fast performance. There’s XMP 2.0 support for trouble-free automatic overclocking. And, they’re available in multiple colors to match your personal preference. Designed for Enthusiasts. Backed by CORSAIR. There's a reason why world-champion overclockers, extreme gaming enthusiasts and high-end system builders all trust CORSAIR for high-performance memory that they can install with confidence and pride. Whether you're breaking your own records or you're simply building a dream gaming rig, you can count on CORSAIR memory. Your performance investment is protected. All of our memory products are backed by a limited lifetime warranty. Why do we need DDR4? There are four major reasons why DDR4 is set to replace DDR3: it's capable of hitting faster speeds, it's capable of hitting higher densities (16GB DIMMs are expected in 2015), it has improved error correction built into the baseline specification, and it consumes less power for equivalent or better performance than DDR3. In short, while DDR3 is butting up against its limitations today, DDR4 still has a tremendous amount of room to scale. Yes! We have been working hard with all major motherboard vendors to ensure compatibility with our high speed DDR4 memory, and that includes XMP. DDR4 employs a new specification, XMP 2.0, while DDR3 remains on XMP 1.3. How does XMP work on DDR4? Very similarly to DDR3, but with some caveats. For starters, Haswell-E tops out at a 2666MHz memory strap, which is very low for what DDR4 can do. Since XMP specifies speeds in excess of 2666MHz, your motherboard BIOS has to compensate somehow. Typically, when XMP tells the motherboard to use a higher memory speed than 2666MHz, the motherboard BIOS will bump the BClk strap from 100MHz to 125MHz. That's normal, but that change will also increase the clock speed of the CPU itself; a well-designed BIOS will compensate and bring the CPU clock speed in line. Where can I learn more about DDR4? We’ve authored a whitepaper that provides a much more detailed examination of this new memory technology. You can find it here. Why am I encountering stability issues with XMP? While we've been working around the clock with motherboard vendors to maximize compatibility and performance, these technologies are all very new. If you have trouble with stability using either XMP profile, we recommend either manually entering the speed and timings the DDR4 is rated for or running your memory at its default speeds until your motherboard vendor provides a BIOS update to improve stability. Why are there two XMP profiles on my Corsair DDR4? We include a pair of XMP profiles instead of just one for users who want to control how much power is consumed by the memory. The first XMP profile runs the DDR4 at its specification of 1.2V, while the second offers a higher speed at the cost of bumping the voltage to 1.35V. The first profile, then, is officially supported, while the second is not and instead offers a baseline of what the memory should be able to achieve. 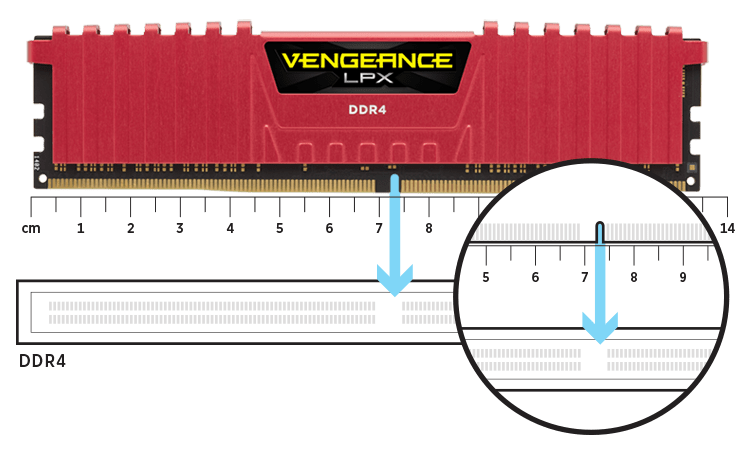 What's the difference between Dominator Platinum DDR4 and Vengeance LPX DDR4? Is DDR4 backwards compatible with DDR3? No. DDR4 and DDR3 have key notches in different places on the DIMM to prevent them from being mixed up, and Haswell-E and X99 are DDR4 only. Is DDR4 slower than DDR3? Because DDR4 uses looser latencies than DDR3 does, it can be slightly slower than DDR3 at the same clock speeds. What makes DDR4 important is that it can easily make up for that deficit by hitting higher clock speeds than DDR3 can. Getting DDR3 to run at 2666MHz or higher requires very careful binning of memory chips and can be very expensive, while 2666MHz is the lowest speed we�re launching DDR4 at. What can we expect from DDR4 in the future? We're launching DDR4 at up to 3000MHz speeds and 8GB per stick densities, but that's just this year alone. DDR4 is expected to hit 16GB densities in 2015, allowing your X99 motherboard to support a staggering 128GB of memory (provided it has eight memory slots). In short, it's gonna get bigger, and it's gonna get faster. I'm running at the default 2133MHz speed, but my system still isn't stable. Double-check to see which memory slots your DDR4 is installed in against your motherboard’s instruction manual. We’ve found that you have to install your DIMMs in the primary set of memory channels first, in order, to ensure stability. If this checks out, please contact our tech support.